I got my first digitial camera back in 1999. It was a Sony Mavica (diskette-based) device, capable of shooting up to 1024x768 pixels, but often happier at 640x480 (a whole 0.3 Megapixels). Since moving to digital I have perhaps printed out (on average) less than one picture a year. My old photo albums effectively stop before the turn of the millennium, they just reside on digital media (when not eaten by hard drive crashes or similar). However with the advent of Polaroid's Pogo printer which I picked up a few months ago on the cheap I've actually been printing off digital images in the Pogo's little sticky-backed 2"x3" format. 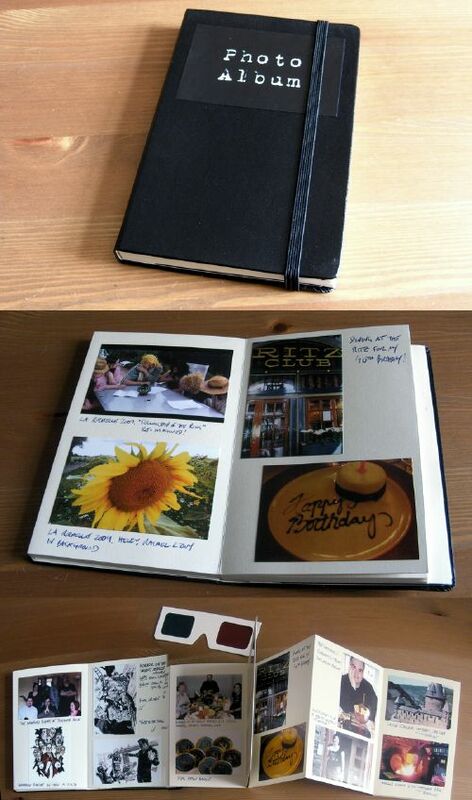 For somewhere to keep them, I'm using a small Moleskine japanese fold notebook and it seems to work rather well. I've even printed out some of the 3D photos I've been taking and put a pair of 3D glasses in the back pocket of the Moleskine. Anyway, if you have such a printer, it's a nice small & portable way to have to physical photos to hand! Yet another idea I may shameless rip off. Excellent idea. I'm intrigued by the Pogo paper. Printing without ink? The mind boggles. Have you noticed any reduction in print quality over time? Any other issues? I believe it is a dye sublimation technique with the necessary chemical pigments being part of the surface of the special paper.